1. unk RUSHWORTH, daughter of Edward RUSHWORTH (1755-1817) and Hon. Catharine HOLMES (1765-1829), was born on 21 November 1792. She died on 21 November 1792. 2. Edward RUSHWORTH, son of John RUSHWORTH and Sarah MAYNE, was born on 17 October 1755. He was baptised on 2 January 1756 in Kingston Church, Portsea. He appeared in the census. He was a Churchman, Member of Parliament. He married Catharine HOLMES on 28 August 1780 in Calbourne, Isle of Wight. He died on 15 October 1817. He was buried in He lies buried in the family vault near to his wife. Edward Rushworth of Freshwater House, Isle of Wight. 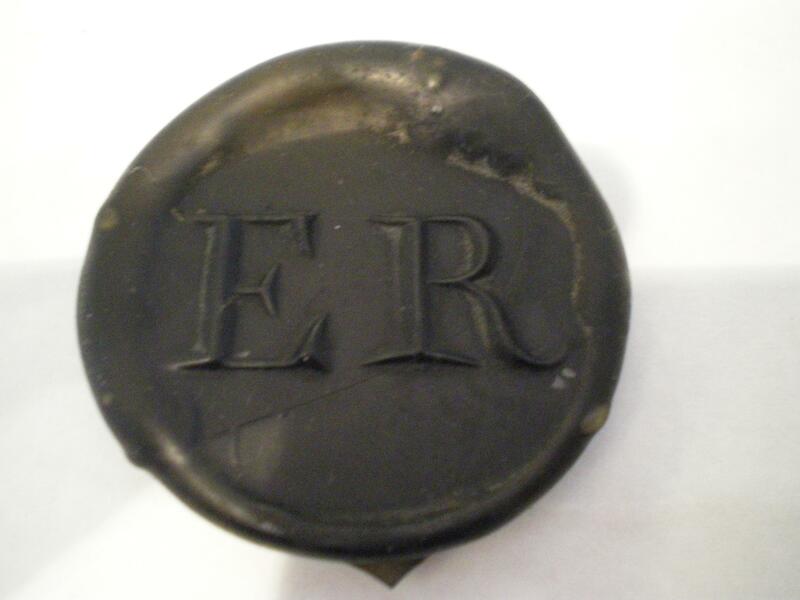 Edward, was without a break the MP for either Newport or Yarmouth from 1784 until 1797. Edward Rushworth was a Founders' Kin Scholar of Winchester College (and a Fellow of Trinity College, Oxon). He took Deacon's Orders in the Church, and was afterwards MP for Yarmouth, Isle of Wight, and Recorder of Newport. He built Farringford and resided there (it is now the residence of Lord Tennyson). 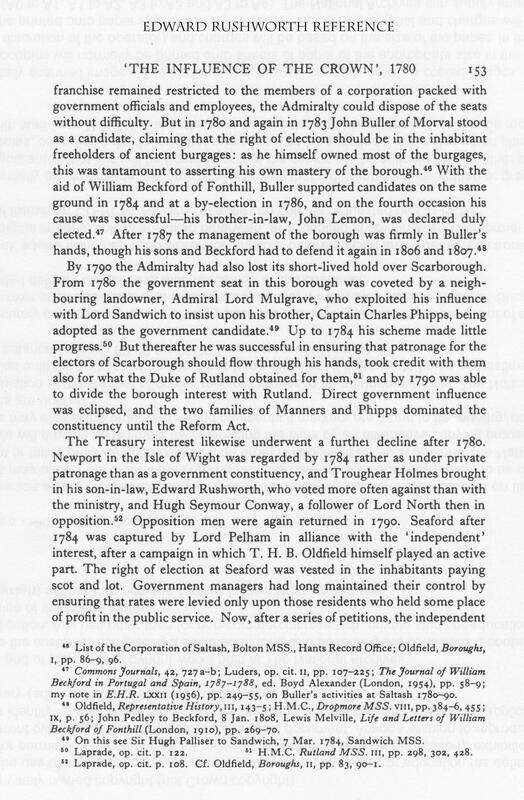 He was also afterwards MP (1784 onwards) for Newport. On his election the unsuccessful candidate, Mr. John Harrington, petitioned the House against the validity of his return on the ground of his being in Holy Orders. A Select Committee was appointed to consider it, and reported that Mr. Rushworth had been "duly elected to serve in this Parliament". Afterwards, in order to get rid of Horne Tooke, an Act was passed disqualifying all the clergy of the Church of England from sitting in the House of Commons. This Act took effect in 1802. Obituary in The Gentleman¡¯s Magazine, Vol.88 Part 1, 1818. EDWARD RUSHWORTH, ESQ. b. At Yarmouth, Isle of Wight, Edward Rushworth, esq. of Farringfordhill, and mayor of Yarmouth. He was seized with apoplexy while sitting on a bench, conversing with a friend, on the Quay at Yarmouth; a medical gentleman was on the spot, who bled him, and caused him to be carried to the George Inn, where he lingered from Monday till Wednesday, when he expired. The death of this truly respectable gentleman excited a sensation of the deepest regret in all who had the pleasure of knowing him. Mr. Rushworth was many years representative in Parliament for the Boroughs of Yarmouth and Newport, and was much esteemed for the independence of his character and for his intellectual endowment!;. He was a gentleman of pure and virtuous principles, steadily and zealously attached to the Establishment in Church and State, and eminently distinguished for a sense of duty in every relation of life. He was an intelligent and useful Magistrate, a good father, an affectionate husband, a kind master, and a firm friend:¡ª On the day of his funeral the shops and private houses in the town were closed (a circumstance, sufficiently expressive to mark the estimation of his high character). In the immediate neighbourhood of his late residence, his death is an event which will be long and deeply lamented, and by it the community at large have lost the benefit of a valuable example. Mr. Rushworth married the Hon. Catherine Holmes, daughter of the late Lord Holmes, by whom he had a large family. 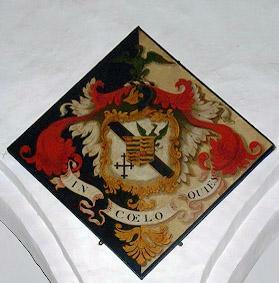 His son and heir is married to a daughter of Sir Everard Home; one of his daughters married to Col. Murray, Deputy-adjutant-general in Ireland, and another to Sir John Pringle Dalrymple, bart. ; and he was father of the late gallant Capt. Rushworth, of the Barbadoes frigate. 3. Hon. Catharine HOLMES, daughter of Lord Leonard Troughear HOLMES and Elizabeth TYRRELLL, was born in 1765. She was baptised on 20 September 1765 in Newport, Isle of Wight. She had the title 'Hon.'. 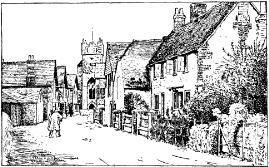 She died on 9 December 1829 in Bowcombe Cottage. Catherine RUSHWORTH (1781- ). Catherine was born on 16 November 1781. Elizabeth RUSHWORTH (1783-1865). Elizabeth was born on 15 October 1783. She married James Patrick 2 MURRAY on 31 January 1803 in Freshwater, Isle of Wight. She died on 15 November 1865 in Benowen, Ireland. Holmes Jervoise RUSHWORTH (1785- ). Holmes was born on 26 September 1785. Edward RUSHWORTH (1787- ). Edward was born on 11 August 1787. Mary RUSHWORTH (1789- ). Mary was born on 27 May 1789. She married John Pringle DALRYMPLE on 20 December 1807 in Freshwater Church. Charles Powlett RUSHWORTH (1791- ). Charles was born on 23 February 1791. Jane RUSHWORTH (1793- ). Jane was born on 31 October 1793. Leonard RUSHWORTH (1796- ). Leonard was born on 19 July 1796. Henry RUSHWORTH (1798-1819). Henry was born on 28 April 1798. He was a Lieutenant in the Indian ArmyS. He died in July 1819 in India. Anne RUSHWORTH (1800- ). Anne was born on 9 February 1800. Margaret RUSHWORTH (1802- ). Margaret was born on 20 February 1802.
unk RUSHWORTH (1804-1804). unk was born on 2 May 1804. She died on 2 May 1804. 4. John RUSHWORTH was born on 25 October 1721 in New York. He died on 30 August 1780 in Cowes (Northwood). He was buried in Church of Northwood, Isle of Wight. He married Sarah MAYNE. John Rushworth was probably a greatgrandson of Daniel, brother of John Rushworth (1607-1690), the compiler of the "historical Collections"(?). He was a Post-Captain in His Majesty's Fleet. His great-grandfather was probably John Rushworth (1607-1690), the compiler of the "historical Collections" who had emigrated to America at the time of Charles I. The Rushworth family, related to the Fairfaxes and to John Rushworth, compiler of the "Historical Collections", had settled in America during the dissensions between Charles I and the Parliament. When the trouble with our American Colonies began John Rushworth, Senior, had to decide whether to give up his interests in America or become a citizen of the new United States and an enemy of England. This (his graddaughter told me in 1885) undermined his helath and hastened his death about the time of the Declaration of Independence. His wife's name was Sarah Mayne. 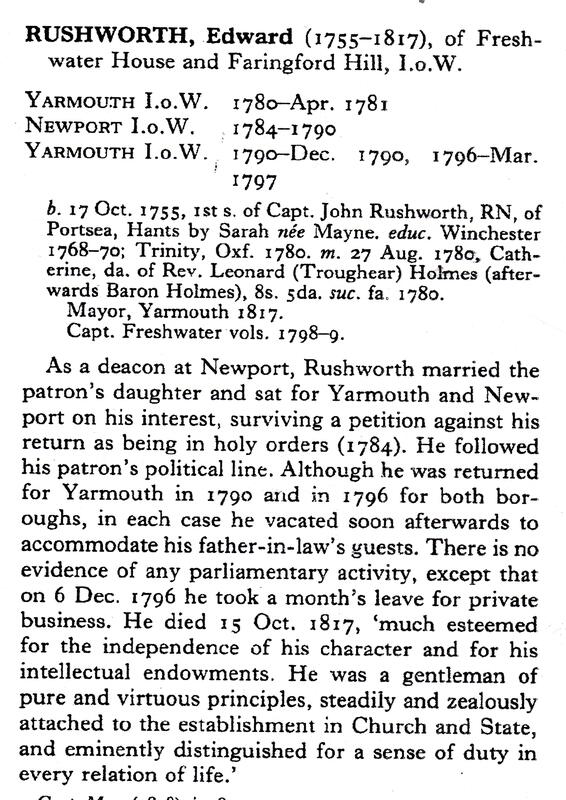 John Senior's death is recorded in the Gentlemen's Magazine, 1780: "At West Cowes, aged 58, John Rushworth Esq. a senior post Captain of His Majesty's Fleet adn regulating the impress Service in the Isle of Wight. Her father, Captain John Rushworth (1721-1780) was buried in Northwood, Isle of Wight. Her brother, Edward, was without a break the MP for either Newport or Yarmouth from 1784 until 1797. In 1780 he had been ordained, but he abandoned Holy Orders when protests were raised against a deacon entering Parliament. His wife, Catherine, the second daughter of Lord Holmes, built Farringford Hall. Also: "In Memory of John Rushworth, Esq., 22 years a Post captain of His Majesty's Fleet..."
The Rushworths had settled in America during the dissensions between Charles I and the Parliament. When the trouble with The American Colonies began John Rushworth had to decide whether to give up his interests in America, or become a citizen of the new United States and an enemy of England. This undermined his health and hastened his death about the time of the declaration of Independence. John RUSHWORTH (1758-1793). John was born on 29 January 1758. He died on 7 September 1793 in Hythe, Southampton. He was buried on 12 September 1793 in Dibden Church, Hythe. Elizabeth RUSHWORTH (1762-1817). Elizabeth was born on 6 July 1762. She was baptised in All Saints'. Southampton. She married John KEELE in 1781. She died on 22 July 1817 in Southampton. She was buried in Southampton. 6. Lord Leonard Troughear HOLMES, son of Thomas TROUGHEAR D.D. and Elizabeth HOLMES, was born on 24 May 1731. He had the title 'Baron (in the Irish Peerage)'. He was a Clergyman. He married Elizabeth TYRRELLL circa 1759. He died on 18 January 1804 in Newport, Isle of Wight. Last Lord Holmes. The Rev. Leonard Troughear subsequently took his mother's name Holmes. He was created Baron Holmes 4/3/1798. Leonard Troughear had succeeded to the title of Lord Holmes when his mother's brother died. 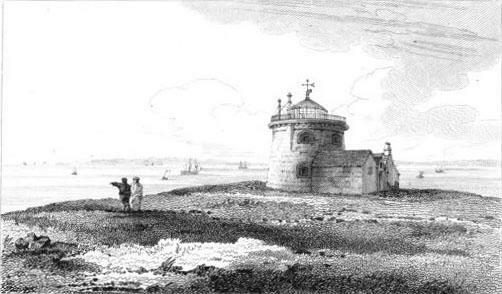 "I think I see very clearly that the governor of the Isle of Wight in elections is but a secondhand interest; either party will be glad to make some sort of terms with him in order to procure favours for their friends, and perhaps it would not have been ill policy to adopt the Irish maxim of joining with the strongest after they had first settled that point amongst themselves". At Yarmouth after Holmes's death there was a division of interests between the Rev. Leonard Troughear Holmes, Lord Holmes's nephew and successor, and Lord Holmes's brother-in-law, Barnabas Eveleigh Leigh; but this was soon composed by each agreeing to return one Member.' 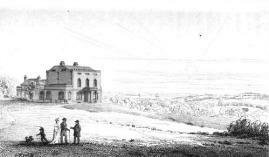 Holmes then offered his interest in the Isle of Wight to Administration, and Stanley advised Grenville to accept. Holmes worked with each successive Administration, and at the general election of 1768 he had Government support in the attack made upon him by the Worsley-Oglander-Jervoise Clarke party in all three Isles of Wight constituencies. 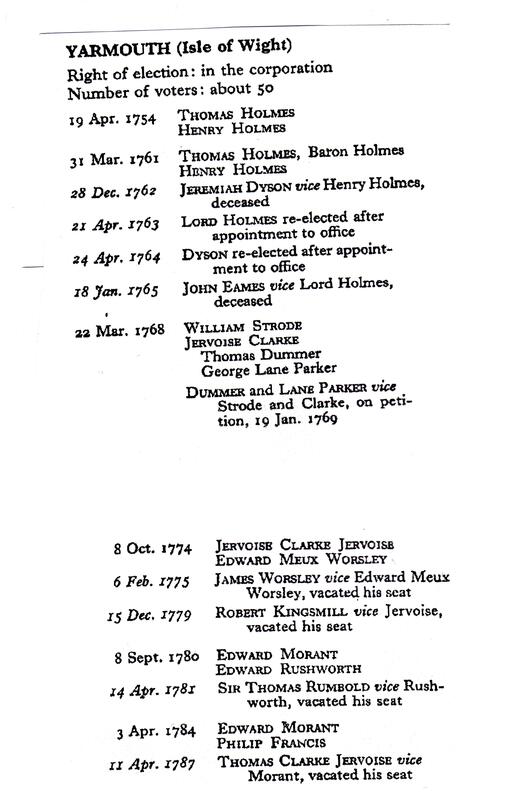 At Yarmouth Holmes's candidates were defeated, but returned on petition; and before the general election of 1774 Holmes and Jervoise Clarke came to an agreement to return one Member each.